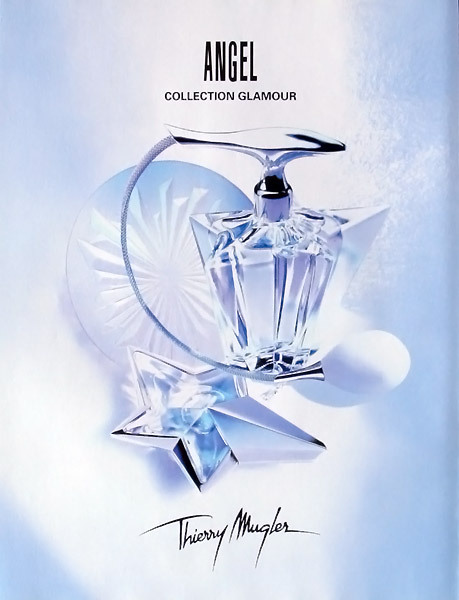 It's hard to bypass Angel by Thierry Mugler in the greater scheme of perfumery's historical progress, as it is truly seminal, a footprint on the path of perfumery as large as the Yeti's. Olivier Cresp, its perfumer, is as much to credit with its innovation, as is its artistic director at Clarins (the Group that holds the licence for parfums Mugler) Vera Strubi, who envisioned the fragrance as a cult modern classic, and Jacques Courtin, president at Clarins, who insisted on developing the product first and only then seeing to its marketing plan; clearly an anomaly in contemporary perfume launching. For Angel, Olivier Cresp and Vera Strubi sought into the identity of Thierry Mugler as a fashion brand and they came up with a fusion of childlike playfulness and iconic, haute couture boldness. On the one hand, the cotton candy and sawdust of the fun fair. On the other, the patchouli darkness of a handsome man in drag. The note of ethylmaltol which makes the cotton candy note in Angel, and which spawned like crazy, to the effect of saturating contemporary best-sellers with bucketfuls of it, was until 1992 fairly unused. Historically speaking it had been introduced in Vanilia by L'Artisan Parfumeur back when Jean Laporte directed the niche brand he founded in 1978, but its ice-cream cone girlishness was deemed too cute for proper perfumes; this was the time when perfumes roared with the bombastic spiciness of things like YSL Opium perfume and Estee Lauder Cinnabar. Olivier Cresp took this discarded idea and flanked it with red berries, a dubious whiff of blackcurrant on top (recalling the success of The Body Shop's Dewberry) and the caramel softness of vanilla bringing out a sort of praline in the facets of natural patchouli oil. The effect was stunning; warm and cuddly but also chocolate-y and dark, and the formula was painted blue, in mocking defiance of every possible evocation of feminine perfume, which until then was always some shade of hay or gold. Angel became le monstre sacré to dethrone Chanel No.5 in France and the rest is, as they say, history. Monsieur Cresp, your place in the Pantheon is reserved, thank you very much.